Daily Illuminator: Who Is Going To OwlCon? We Are! 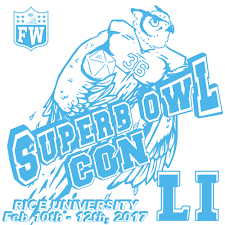 February 9, 2017: Who Is Going To OwlCon? We Are! Whooo is going to be at OwlCon this year? Whooo? We will! I'm back on the road again! I will be joining our awesome Houston MIBs this weekend at OwlCon, at the Student Center (and surrounding buildings) on the Rice University campus in Houston, TX. Stop by Mid Level Conference Room 1 to say "Hi!" to Houston MIB Demo Team members Christopher, Don, James, Jessica, John, Maurice, Marybeth, Neal, Sarah, and me, check out our latest games, and get the scoop on new releases. Munchkin fans, this is the convention for you! We're playing many different flavors here, including Munchkin Oz, Munchkin Fu, Munchkin Steampunk, and Munchkin: Marvel Edition! If you've a mind for something "bigger," Ogre Sixth Edition and Ogre: Objective 218, our classic games of armored combat, are also crashing into OwlCon, and they'll be crushing everything in their path. More gaming goodness to try: Play as Gotham City's greatest supervillains and get the most loot in Batman: The Animated Series Dice Game. Get the most braaaiiiinnnsss without getting shotgunned in Zombie Dice. Blow up the most cities in Mars Attacks Dice Game. We'll also be offering OwlCon attendees a sneak peek of Ghosts Love Candy. Haunt the trick-or-treaters and steal their best candy, but don't scare them away! If you have an oral history-exam coming up, check out our most excellent, giant-sized copy of Bill & Ted's Excellent Boardgame! Fans of feline frolicking will love Simon's Cat Card Game; have fun, make messes, but don't get the blame! There's a lot to do at OwlCon, so come by and say "Hi! ", play some awesome games, and pick up a little swag. Plus, if you show us your #SuperbOwlConSuperMunchkin post on social media, we'll give you even more swag! See you there!